For most people, any goal or pursuit taken up 10 years ago is probably a long-gone memory. But for Charlie Kested of Johnstown, NY, there’s one thing that has been a constant in his life for the past 10 years. For the last decade, Kested has regularly sequestered himself away in his basement workshop, carefully carving, letter by letter, every single line of the Declaration of Independence out of dark walnut wood. Times have changed. The popular music on the radio has evolved, as has fashion and television. Kested himself went through some changes, suffering a stroke that impaired his speech and his motor ability. But throughout the years, the whirring of the blade of his scroll saw has remained constant, as has Kested’s unfailing patience for his work. The massive piece, which is nearly as tall as Kested himself, was finally completed several months ago. 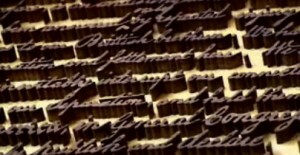 It’s an exact wood model of the Declaration of Independence, right down to the flourish of John Hancock’s signature at the bottom. The dark walnut words are a stark contrast against the Baltic birch background. It was a labor of love that Kested said he knew he would eventually complete. The time spent on the piece paid off, when he was awarded first place and best in show at the 2010 Florida State Fair. The 81-year-old retired industrial arts teacher began experimenting in wood working when he was a child growing up in Fonda. Both his father and grandfather were accomplished woodworkers, he said. “My grandfather had a lathe at home. I was maybe 10 when he got a box, stood me on it and put a tool in my hand. I did my first turn,” he said. From then on, Kested showed an interest and skill in woodworking. 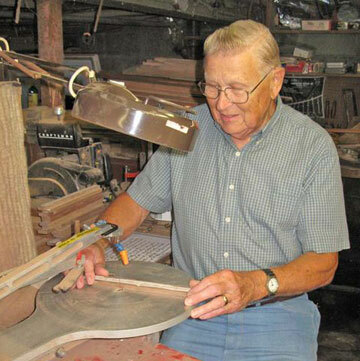 He went into the Navy in the 1950s, where he attended wood pattern making school. He worked for years making models out of wood that would then be used to make cast-iron products for the Navy before returning home and becoming a teacher in the Fonda-Fultonville Central School District. He’s made model medical prosthetics for replacement chins, noses and other body parts. He’s replaced the dashboard of an old Rolls Royce, and has worked making quality-control models for a variety of applications. He was looking for a special challenge, though, and found it in the Declaration. He started the Declaration of Independence in 2000 and worked on it, little by little, over the years until it was near completion. A stroke, though, less than a year ago put the project, and his life, in peril. Luckily, Kested emerged from his ordeal far better than some others do. He can no longer feel any sensation in one hand, but is able to still use it and still has a strong grip. His speech is slower and he sometimes struggles to find words, but ultimately he’s made a good recovery, he said. After some therapy he was able to resume work on his project, carving the final bits of punctuation and adhering them to the birch background. He said he hopes his experience inspires others who deal with a similar issue. “I feel really blessed. I want people to know that you can still do things, that they shouldn’t give up, they should keep on going,” he said. Kested did keep on going, straight to the Florida State Fair earlier this year, where his piece attracted a lot of attention. Kested and his wife, Beverly, live in Florida during the winter months. Peter Richardson, editor for the St. Petersburg Wood Crafters Guild in Florida, said the fellow woodworkers who saw Kested’s piece at the state fair were amazed by it. Richardson called the piece “museum quality.” He said Kested’s stroke makes his accomplishment even more astonishing. Aside from his prize-winning Declaration, Kested is an accomplished woodworker whose made everything from grandfather clocks to ornate, minutely-detailed decorations to jewelry armoires. His home in Johnstown is full of his work, from the entire kitchen to the “love spoon” adorned with roses he carved for his wife. Beverly Kested said she is constantly in awe of her husband’s skill. She smiled as she warmly recalled when the pair first met while he was visiting the area to attend a wedding during his time in the Navy more than 50 years ago, and was eager to praise her partners accomplishments. The Kested’s said Charlie’s work on the Declaration led them to learn more about the history of the document, which both called fascinating. Now that it’s finished, it will remain in the Kested family as a treasured heirloom, the pair said. Kested said he isn’t taking a break from his woodworking now that his long-time project is finished. Next up, the Gettysburg Address. That piece, the pair said, will hopefully be ready for next year’s state fair. This article first appeared on July 4, 2010 in The Leader-Herald, a newspaper in Gloversville, New York. After getting an extraordinary amount of feedback on this article, we followed up with Mr. Kested by phone. 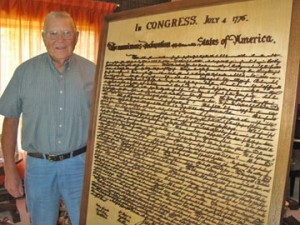 You can see our latest report on Charlie Kested and his plans for the Gettysburg address here. Charlie,you have truly inspired me. On this veterans day, off to the shop i go sir. I thank you for your service.. Again, job well done!!! Thank You for caring about our constitution!!! Mr. Kested, It has been a great pleasure being a member of the St Pete Woodcrafters Guild with you. The level of your work is a constant encouragment to me to bring my scroll saw work up to the highest level. Thanks for serving our country in the military and thanks for being a member of our guild in Saint Petersburg, Florida. Mr. Kested, your skill amazes me. Your dedication to the project, even more so. There is some remote possibility that I could develop the skill with some practice but there is no way that I would ever be able to stick with such a delicate project for the length of time it would, and did, take to complete it. It is so sad that our children and grandchildren are not taught the Declaration of Independence and our Constitution, much less the respect for them as the founding documents of the Greatest Nation in the history of the world. I pray that your work will lead at least a few to see them in the light they deserve. Maybe even touch a politician or two. Thank you, especially, for your dedication to our Nation through your Military Service. That and this wood project make you a hero. God Bless You and your family who must be very proud of you. Remembering today and your sacrifice and service, November 11, 2010. Thank you. The dedication, skill and tenacity to commit the last ten years of your life is nothing short of amazing. I wish you good health and many wood creations in your future. Beauty in every exquisite detail. Truly inspiring Mr. Kested! I hope to one day have something close to the skill you have. Thank you for your service to this country. As a husband, father, Vietnam veteran, grandfather and the son-in-law of a WWII Army infantryman (whose twin brother survived the Bataan Death March, Hell ships and three years in a Japanese slave labor camp), I am grateful to men and women from your generation who understand the cost of freedom. I pray that future generations never lose sight of your sacrifice. You are an Inspiration. As a Veteran and as a Professional Artist – You are Amazing. Thank you for Your Service to this Country – as a Man and a Fine Human Being. Your inspirational project on an inspirational document seen on this inspirational day (11/11) is something of true beauty. Thank you. Amazing work and dedication. Thank you for your service to our country. I am curious why American Colonists (such as George Washington) did not want to pay taxes for the 7 Years War (which he started in North America)? First, thank you for serving this great nation. Second, what an accomplishment. This is one of the greatest examples of craftsmanship and love that I have seen. I do wish I had the opportunity to see this first hand. Hopefully, this will one day find its place along side the real document. Truly this is a museum piece and you are to be commended on your dedication. One can only hope that future generations will still be able to read the words and truly understand the sacrifices made by our founders to allow following generations to live free in this great nation. As a USMC veteran I salute you sir!! If only we all had your dedication and perseverance! Charlie, your craftsmanship is enviable and your work of art outstanding. But your perseverance and courage is what inspires me. I will remember this for the rest of my life. Thank you and God bless. Hi Charlie, Great work both in the project and in the recovery , God Bless, Jack Masten, North Creek, NY. I am awed and amazed at your handiwork. Thank you and God Bless you for your service and dedication. Looking at your accomplishment leaves me in awe and somewhat envious. It’s a beautiful work of art. The patience, time and skill that has gone into this copy of the U.S. Declaration of Independence shows the determination of a true artist. Thank you, and Highland Woodworking for sharing this accomplishment with all of us. What an accomplishment. I share your pride in both your work and our wonderful country. From one veteran to another, I salute you. May God bless you. Wow! Just Wow! You are simply an amazing person. Your work and your story reminds me to keep little frustrations in perspective. You have truly inspired me. Thank you for your work and more importantly for your service to our country. I salute you sir! when I get older,( I’m only 64 ! ). GOD BLESS You SIR, You are a perfect GOOD example for the rest of us. Myself being a woodworker and a veteran (Korea) salute you. I do intarsia, but nothing as grand as what you have done here.You are truely a Hero. Charlie I’ve done the Lords Prayer and the 23 Pslam but you have done the greatest. Where and how did you get the patterns and convert them? Once again great work. Excellent Job! You should send it to the Smithsonian Institution. Charlie, you inspire the rest of us do do more, do better and never quit when the chips are down. Your piece deserves to be in the Smithsonian one day. Stanyel C.
A true labor of love for one’s country. A tip of the leather fire helmet to you, sir! Semper Fi Charlie. A wonderful piece of woodworking and history. God Bless You! This is such an amazing piece of art, you have shown in every letter the love you have for this great country. Thank you for sharing your passion with me. Thank you for your dedication. God Bless you and your lovely wife. What a great story! I just featured it on the internal blog of the National Archives. I hope I am as inspired by the holding here when I am in my eighties! Bravo! Very neat job and I bet it took quite a while to finish the project! I am glad that the stroke didn’t stop you from doing what you love the most! outstanding piece of art. but then again i would expect nothing less from this man. he was my high school wood shop teacher and a damn good one at that. Such a beautiful story and God Bless you. I hope to one day have something close to the skill you have. Thank you for your service to this country. nothing but wow! this is patience and dedication right here. With this, you can accomplish anything.